fashionmix: Omg - Benefit cosmetics !!! Every beauty guru on youtube raves about Benefit cosmetics. Some of the youtubers opinions are valuable for me, so not long time ago i decided to get some of the best sellers. Products from this brand are not cheep .So the best way to try out stuff is to buy little kits were you can get sample sizes beauty stuff. I ordered Primpimg with the stars kit. Stay Don’t Stray: Eye and concealer primer. you would use this to keep eyeshadows and under-eye concealer in place and keep it from moving around. The Porefessional: Primer and pore-minimizer. I use this every day! Some Kind-A-Gorgeous Foundation in Medium: The one bummer of kits like this is the foundation included is ALWAYS medium. womp womp. Useless for me! Girl Meets Pearl: Liquid Highlighter. Can be used on top or underneath foundation depending on how noticeable you want it. Also awesome to mix with tinted moisturizer! They’re Real! Mascara: Benefit’s popular mascara with a unique wand that sort of hybrids the traditional mascara wand with those sphere like ones that help to get small lashes under eyes and in the inner corners. Another nice thing is the instructions on how to use each product to get the best results. This instructions cover the mirror but you can tear off this papers. For me Pore fessional and The real mascara are the most amazing products !!! 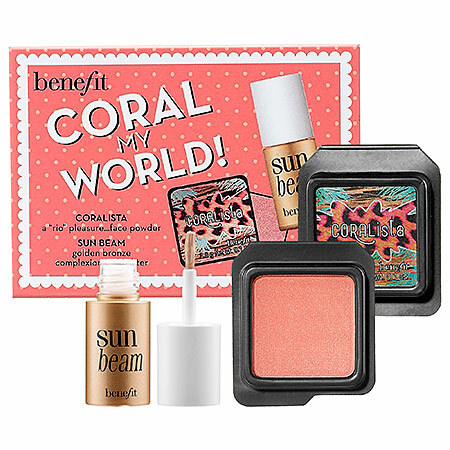 Another tiny little kit from Benefit cosmetics is Coral my World.This set contains blush Coralista and highlighter - Sun beam. Can not wait to try out another products from this brand. 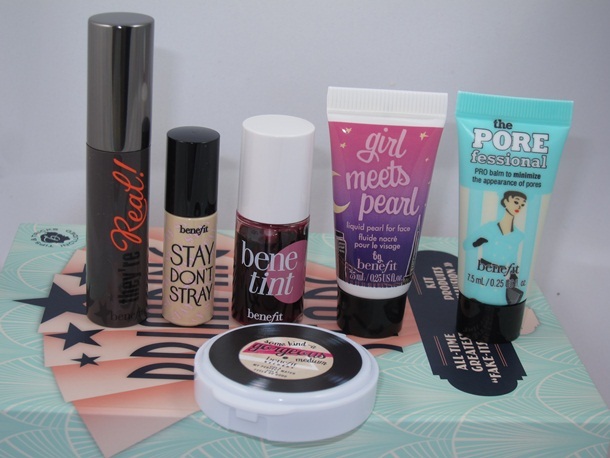 so in love with benefit products!! also love the theme/design), I don't have time to read it all at the moment but I have saved it and also added in your RSS feeds, so when I have time I will be back to read a lot more, Please do keep up the great work.